DISYS Solutions Inc. (DSI) was founded in 1991 by the current owners, Atul Bhatia (CEO) and Vinu Luthra (COO). We are headquartered in Ashburn, Virginia, with offices conveniently located in Colorado, Florida, Georgia, Maryland, North Carolina, and Texas. DSI is a certified Minority-Owned Small Business that has grown into a national IT Value-Add Reseller and Service Provider of top industry vendor products and solutions. DSI provides complete IT solutions and services to nationwide customers including commercial companies, Federal agencies, and State & Local Government and Education (SLED). We put the customer first and understand the importance of providing a valuable experience from start to finish – from site surveys to implementation, and ongoing technical support backed by our team of certified engineers and experts. Atul Bhatia and Vinu Luthra formed Network Connections, Inc. located in Fairfax, Virginia, that focused on network installation and support. Revenues reached $25K in their first year of business. Moved to Chantilly, Virginia, and won their first SLED contract with the state of Virginia. Company name changed to AV Networks, Inc.
Won various SLED contracts with the states of Georgia, Maryland, and North Carolina, the majority being for HP computer and printer products. Revenues reached $44M (all SLED business). Merged with DISYS (Digital Intelligence Systems Corporation), a Fortune 500 staffing-only company. Combined company revenues in 2000 reached approximately $50M. Focused on company growth. In 2009 reached revenues of over $200M. Atul and Vinu dissolved their partnership with DISYS and became an independent company named DISYS Solutions Inc. (DSI), continuing their mission to provide complete IT solutions and services. Won major Federal contracts with NASA (SEWP V) and NIH NITAAC (CIO-CS). Moved headquarters to a larger, newly renovated facility in Ashburn, Virginia. 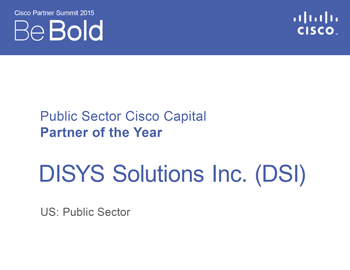 Awarded "Public Sector Capital Partner of the Year" at the Cisco Partner Summit. Won Federal contracts with the U.S. Department of Commerce and U.S. Patent and Trademark Office. Won major SLED contracts with large secondary and university systems. Revenues reached over $100M. Opened new Network Operations Center for 24/7/365 monitoring. Achieved Advanced Internet of Things (IoT) Specialization for Connected Safety and Security and the Advanced Service Provider (SP) Optical Technology Specialization. 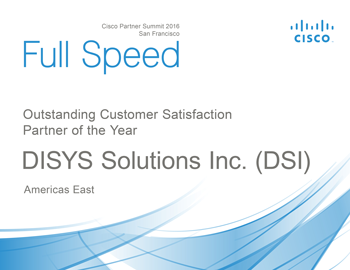 Awarded "Outstanding Customer Satisfaction Partner of the Year" at the Cisco Partner Summit. Atul Bhatia sets the company’s strategic direction and focuses on the development of financial strategies to support operational growth. With more than 27 years of organizational and management experience in the IT industry, his expertise as a skilled negotiator and visionary of lucrative market opportunities have contributed to DSI’s continued success in the marketplace. Mr. Bhatia is an alumnus of Strayer University with a degree in Computer Information Systems. He co-founded (with COO Vinu Luthra) Network Connections, Inc. in 1991, which became AV Networks, Inc. in 1993, where he served as President. The company began by repairing and networking on-site computers for local government and commercial customers. AV Networks, Inc. grew to $44 million in revenue, earning several multi-million dollar government contracts nationally before merging with DISYS in 2000. Mr. Bhatia was responsible for initiating the merger which transformed the company into a complete end-to-end solutions provider. After growing to over $200 million in revenue, DSI became an independent company in 2010, with a continued mission to provide complete IT solutions and services. Vinu Luthra oversees the company’s daily operations, including the contract proposal process and the sale/implementation process of IT solutions and services. With more than 30 years of experience in the IT industry, his expertise and dedication have led DSI to winning several multi-million dollar government technology contracts nationwide. Mr. Luthra facilitates DSI's continued success by mentoring the sales and engineering personnel to maintain above-standard customer service skills and knowledge of current and emerging technologies. Mr. Luthra's knowledge of unique government policies and suitable technology solutions, despite the rapidly changing market trends and conditions, has allowed DSI to analyze critical business needs and develop innovative, cost-effective solutions for customers. Mr. Luthra is an alumnus of Delhi University with a degree in Mathematics. He co-founded (with CEO Atul Bhatia) Network Connections, Inc. in 1991, which became AV Networks, Inc. in 1993, where he served as Vice President until the merger with DISYS in 2000. After growing to over $200 million in revenue, DSI became an independent company in 2010, with a continued mission to provide complete IT solutions and services. 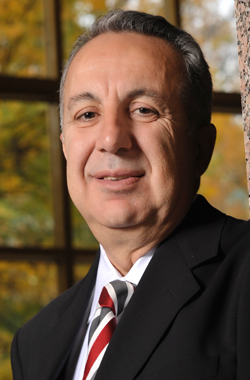 Alan Bechara is responsible for overseeing the planning, coordination, and execution of DSI business goals. Mr. Bechara brings more than 25 years of industry experience to the position. Mr. Bechara has been very successful at developing the vision, direction, and strategies required for leading businesses and creating a positive corporate reputation. Prior to joining DSI, Mr. Bechara was President of PCMG, Inc. where he developed the company into a leading national government IT reseller. His tenure was capped with record revenue and profit in 2014 that more than tripled in three years. Mr. Bechara was also Vice President of Insight Public Sector (formerly Comark), a start-up sales and marketing organization that grew to $200 million in revenues during his tenure. DISYS Solutions Inc. (DSI) is proud to announce the promotion of Alan Bechara from Senior Vice President of Sales & Marketing to Executive Vice President. Mr. Bechara is responsible for overseeing the strategic planning, coordination, and execution of DSI business goals. He also manages the continued development and growth of the sales and marketing teams to achieve objectives and generate new business. DISYS Solutions Inc. (DSI), a Cisco Gold Certified Partner, recently achieved the newest of Cisco’s specializations – Master Networking. 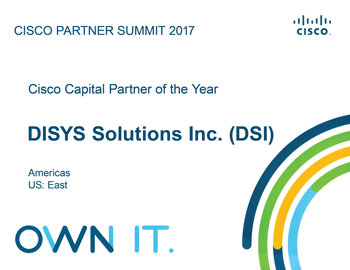 This makes DSI only the second Cisco Channel Partner in the Americas to hold this specialization. 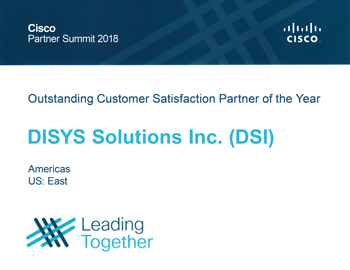 DSI is proud to announce the renewal of their Cisco Gold Partner certification, the highest certification level within the Cisco Channel Partner program and a certification DSI has held since 2013 (DSI has been a Cisco partner since 2001). DSI qualified for the renewal without an audit, meeting all requirements for maintaining the Gold Partner status including personnel, support, specializations, and Hybrid IT.